Jaws did an excellent job in 1975 of creating a movie monster out of the great white shark. You see dear readers, for a long time people believed that sharks had never attacked a human being. And it wasn’t until the early 21st century that some attacks happened which inspired Jaws. This lead to sport fishing of sharks over a few decades and a sever decline in several shark populations. But that was before scientists worked to prove that sharks were not vengeful man-eaters and as well, our medical ability to respond to bites has dropped the fatality rate down considerably. Jaume Collet-Serra is a Spanish film director and producer. Known for such films as House of Wax, Orphan, Unknown, Non-Stop, and Run All Night. Collet-Serra will also direct his fourth collaboration with Liam Neeson in the 2017 action-thriller The Commuter. The Shallows is definitely his best film to-date, in a very lean thriller that makes good use of Blake Lively as both a comedic and dramatic actress. With that said, let’s go over the plot, shall we? The film introduces us to it’s lead Nancy (Blake Lively) pretty much right away, with her on a trip to visit a secluded beach in Mexico, one which her mother visited while pregnant with Nancy. Seeing as how Nancy’s mother recently passed away, the daughter thinks it apt to surf the beach and think upon whether she ought to continue medical school. Meeting up with two other young guys, she surfs the waves for several hours before the locals decide to head in. Nancy is not content with this and decides to ride one more wave. As she is preparing to surf, she notices a dead whale, and is then attacked by a great white shark. Using her wits, some costume jewelry in the form of a stitch job, and befriending a seagull she names Steven, Nancy is able to bandage her leg wound with parts of her wetsuit, and perch herself upon a rock for the night. Unfortunately she is about 200 yards away from the shoreline, and while she eventually sees both a drunken thief eaten by the shark, as well as the two young men from the previous day attacked, Nancy still cannot get back to the shore. One of the guys was wearing a GoPro, so Nancy records a message to her dad and sister, and makes an attempt for a buoy. I’m not going to tell you how the story ends, but I will say this. Yes you could compare it to Jaws, but in some ways it reminds me more of other survival stories like 127 Hours and Hitchcock’s The Birds. Pros: It will get your heart pounding and engage your senses, while also making you feel like you’re there with Lively as she determines what to do at each twist of the plot. Cons: The backstory of Nancy is somewhat tacked on, and there are moments where it was obvious she had been CGI’d right into the body of a competent surfer, making me wonder if an unknown but talented actress might have done a better job. This summer was kinda bland. So it was nice to finally see a solid blockbuster thriller shot on a shoestring budget. The spirit of the film is definitely inside of this theme of survival, and while Blake Lively is not the most diverse choice on the planet, she does well in this particular role. 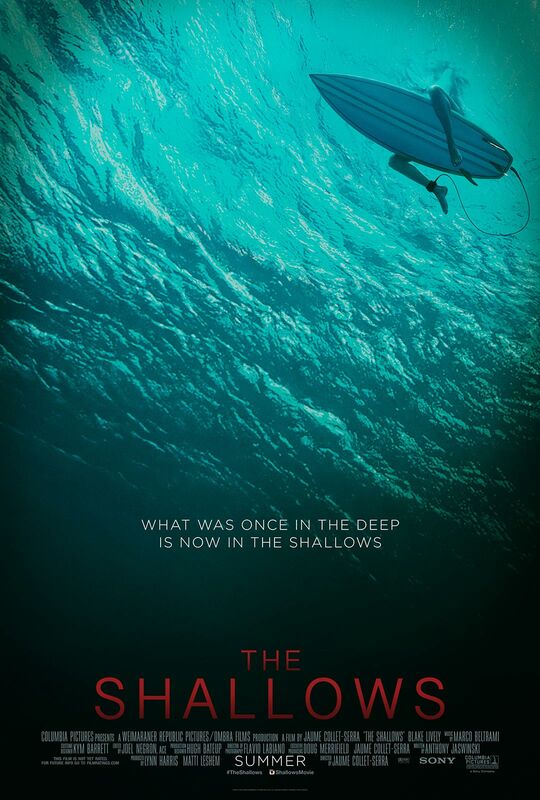 If you have any interest in either survival films or movies that riff off of the common shark in the water homage, you’ll probably enjoy The Shallows. I fully expected this movie to startle me and make me think on that classic tale of man vs shark, and the immortalized phrase… don’t go in the water. Well, if I’m being perfectly honest, I have no plans to go in the water for the next ten years at least. So good job to The Shallows, for giving me a deep fear.